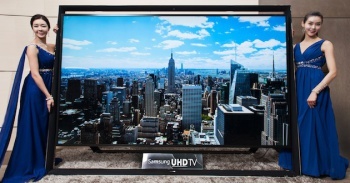 Samsung's new 110" ultra high-definition TV goes on sale this Monday, usurping its $40k 85" model. When Samsung unveiled its monstrous 85" ultra high-definition TV back in January, it said it would have a 110" model on the market by the end of the year. Slipping in just in the nick of time, the S9110, a ludicrous 110" UHDTV will go on sale in China, the Middle East and a few European countries on December 30, before rolling out to the rest of the world. There's no word on pricing yet, but considering the fact that the 85" model cost a whopping $40,000, you can safety assume it's for the likes of millionaires only. At 2.6-meters by 1.8-meters, the 110" UHDTV is the world's largest television set, and is bigger than most king-sized beds. Samsung claims that the target audience for the S9110 is large companies and government agencies, most likely the only people that will be able to afford it (and find a place to put it). Samsung's range of 4k TVs, including the much-more-modestly-priced-but-still-super-expensive 55" ($5,499) and 65" ($7,499") varieties offer all of the company's latest features like 3D, Micro Dimming Ultimate LED display, Wi-Fi, an embedded camera, and support for Evolution Kit upgrades - something the company claims will let it keep pace with any future UHD standards. For those of you wondering what all the fuss about ultra high-def 4K TV is - 4K TV delivers four times the picture resolution of 1080p Full HD. That's eight million pixels compared to two million pixels. In layman's terms, remember how good you thought 1080p was when you first saw it compared to standard definition? Well, 4K TV makes 1080p look like standard-def.